Howard the Duck TM & Â© (c) 2008 Marvel Characters, Inc. BACK ISSUE TM & Â© (c) TwoMorrows. Call him the "outsider writer." Gravitating from gravitas to ha-ha's (sometimes within the same book), Steve Gerber may have been the most offbeat writer ever to pass through 575 Madison. If guys such as Sal Buscema, Jim Mooney, George Tuska, and Don Perlin represent the 'house art style' of 1970s Marvel Comics, Bill Mantlo, Gerry Conway and Doug Moench surely represent the 'house writing style"--dependable and ubiquitous. Count Gerber among this genre of writer. And yet--he wasn't. His name was everywhere. But he was also a little different, a little more ... eccentric. His work took detours. Looking back, the characters Gerber spent the most time and energy writing seemed to come from left field or under the radar. The imaginative writer became the glue of quality and consistency at Marvel, whether scripting The Man-Thing or his quirky, quacky Howard the Duck . Like the way he narrated those Man-Thing comics. Or the oddball Howard , a true novelty and a truly radical departure from superhero stuff. As dorky as Howard may have been, that alien fowl shared a lot in common with the supernatural characters that Gerber often scripted. Meanderers, misfits, misanthropes--the ultimate outsiders. When Gerber introduced Howard the Duck in "Man-Thing" (in Adventure into Fear #19), I never questioned it. The Duck somehow fit it seamlessly into the Marvel Universe. As a kid, I took it for granted when I saw those great Marvel ads--Spider-Man, Hulk, Iron Man, Howard the Duck ... of course, a cigar-chomping bird would be in that milieu! As an adult, I realized how desperate Gerber seemed to shoehorn something personal, observed, and different into an art form that was calcifying into formula. "It was a really neat time in the comics industry," writer/artist/editor Al Milgrom recalls of the halcyon days when Gerber let his hair down at Marvel. Milgrom, who inked a couple of issues of Howard the Duck and collaborated with Gerber on Guardians of the Galaxy , worked uncredited on Gerber's Man-Thing , assisting, with Jim Starlin, on Rich Buckler's art. "It was the first time, in the late '60s and early '70s, when comic-book fans who loved the medium got into comics with the idea of doing comics [as opposed to strips and other media]. This whole group of guys from all over the country at the same time--because of the Marvel revolution--it became much more of a fan club, that Stan Lee attitude. It was the next generation after Stan introduced the stuff. Roy Thomas, Denny O'Neil, then [Len] Wein, [Marv] Wolfman, Starlin writing his own stuff. A certain amount of it was trying to stay the course, continue Stan's superheroes. "But there was a group that did more personal, introspective stories. Not quite the scale of saving the universe. A lot more personal, a lot less commercial. Steve was one of them. He was probably one of the least commercial of those guys." Simon Garth, the Zombie ... Michael Morbius ... Dr. Ted Sallis (Man-Thing) ... the Living Mummy ... Lilith ... Daimon Hellstrom (the Son of Satan). Here's a look back at those seminal supernatural characters that we will shorthand as ... the "Gerber's Gruesomes"! 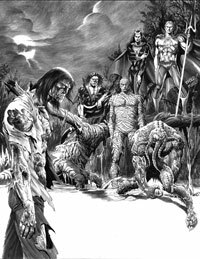 Illustrated specifically for BACK ISSUE #31, a collection of Gerber's creepiest characters by the Zombie's pencil-master, Pablo Marcos. (c) 2008 Marvel Characters, Inc.
One of the most important people whom Steve Gerber met as a youth would become a big part of his professional life--Gerber's future Marvel Spotlight and Tales of the Zombie editor, Marvel's then-editor-in-chief, Roy Thomas. "Steve and I first met through the mail, after the first issue or so of Alter Ego came out, and he learned that we were both in Missouri," Thomas tells BACK ISSUE . "He was in junior high, I was just finishing up college and then doing some teaching, so we communicated and he would send me these longish stories of a Legion of Super-Heroes-type group he drew on some kind of paper with roughly the consistency of today's paper towels. This was in 1961-1962. "Before long," continues Thomas, "we met in person, and I spent some time at his parents' home in University City, a suburb of St. Louis; they were nice people. I also met several of Steve's friends, some of whom did fanzine work together. In fact, I suggested they do one called Crudzine , using a term of the day for a badly done fanzine. I still have that. I was originally going to contribute, but never got around to it ... but they did a very good parody of a bad fanzine, much of which will be printed in an upcoming series in Alter Ego (AE) , in Bill Schelly's Comic Fandom Archive , utilizing an article written by John G. Pierce several years ago and slated for early publication not long before Steve died." Thomas and Gerber's destinies took a detour and headed down a different path ... paths that would eventually cross on the road to Marvel. "At one time in early '65," Thomas remembers, "after I was publishing AE , I was contacted by someone who wanted me to put together a MAD -type magazine, and I turned to Steve and his talented friends. We were going to do it together, though I'd have been editor. But the guy who made the offer was a flake, and things quickly fell apart. I don't even recall the details, although we'd already begun to do some stuff. After I moved to New York City in the summer of 1965, we kept in touch. "When Steve graduated from high school in 1965, he took a trip to NYC and stayed for a few days at Dave Kaler's apartment on E. 2nd Street, off Avenue A, in the Lower East Side, which I was sharing with Dave at the time. At his request, I introduced him to Stan, but had warned him in advance that Stan could just spare a couple of minutes. Stan found him bright and interesting, though, and they talked for quite a while. I don't recall about precisely what ... I was busy doing my job elsewhere, and I don't remember what Steve told me about the conversation. That was more than half a decade before he worked for Marvel, of course. "In 1967-1968," Thomas recalls, "when I flew down to St. Louis once or twice to see Jean Maxey, my future wife, who was in college there, I'd see Steve as well. And at one time in '68, since her parents wouldn't let her go out with me, Steve was happy to act as the 'beard' in the situation. He picked up Jeanie, delivered her to me, and went his way. When the two of us eloped shortly afterward, however, it was an old boyfriend of Jeanie's that acted as the beard. "Then, in the early '70s," he continues, "I got a letter from Steve that basically amounted to 'Help, I'm going crazy working for this advertising agency in St. Louis.' As Jeanie put it later, 'What we didn't know at the time was that it wasn't a work-caused illness.' We both considered Steve a little nutty, though in a good way--he was just very excitable, given to occasional bouts of near hysteria, or so it seemed to us at the time. I gave him a job at Marvel first chance I got, which was very soon afterward, but Steve wasn't a good staffer at the time. Once, I found him asleep at his desk when he was supposed to be proofreading. He always claimed it wasn't narcolepsy, but I think it was some sort of ailment, perhaps psychological. He wandered off staff ere long, but was kept reasonably busy as a freelance writer, especially once we started all those black-and-white horror mags." DON'T SNICKER, HERE COMES THE MAN-THING! Magnificent Mike Ploog art (inked here by Frank Chiaramonte) from the Steve Gerber-scripted Man-Thing #10 (Oct. 1974). Man-Thing may have been Marvel's answer to DC's hot Len Wein/Bernie Wrightson creation Swamp Thing, however, with Gerber helming the series, it transcended a deadbeat destiny as a secondhand swamp creature feature on several levels. For one, the book became the unlikely launchpad for Gerber's most heralded creation, Howard the Duck. 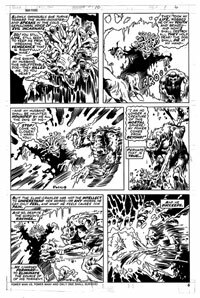 Man-Thing also operated from a unique narrative device: All those pronouns as the narrator talks to the erstwhile Ted Sallis on an emotional level, describing how he feels. 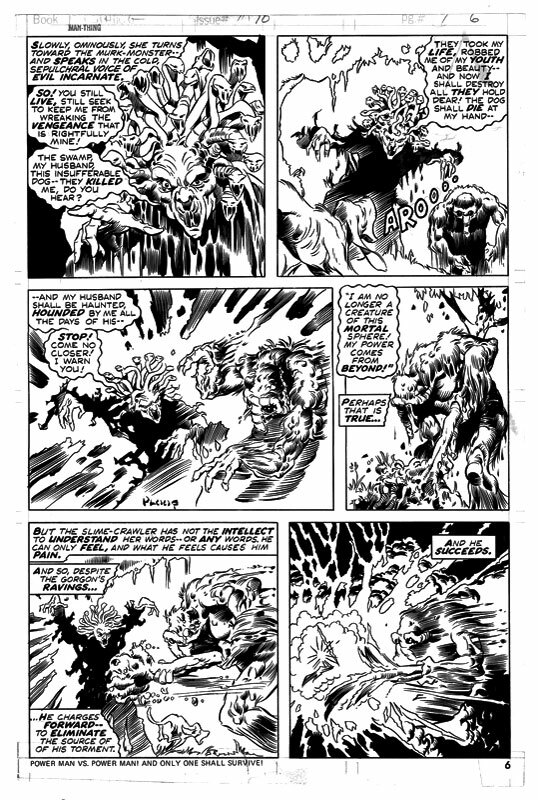 If writer Roy Thomas [with Gerry Conway] and artist Gray Morrow stylishly created the Man-Thing formula in a Savage Tales #1 story awash with Morrow's grays, Gerber cemented it, pounding even harder on the second person narrative device, and introducing the line that would forever become the character's tagline: "Whoever knows fear burns at the Man-Thing's touch." In the initial Gerber stories, Man-Thing's world intersects with Andy and Jennifer Kane, a pair of kids who live with their grandfather, Joshua. Gerber's first issue, Adventure into Fear with Man-Thing # 11 (Dec. 1972, art by Rich Buckler and Jim Mooney, with a Neal Adams cover), sets the pre-teens up as Man-Thing's allies. At times, the visuals, with their sickly horror element combined with the kids' plotline, resembles something out there, such as Charles Burns' Black Hole . In Fear #12, with art by Jim Starlin with inks by fellow Detroit delineator Buckler, Man-Thing tracks a spooked cop. By Fear #16 (Sept. 1973), "Cry of the Native," drawn by Val Mayerik with inks by Sal Trapani, Gerber introduced thorny socio-political plotlines into the series, with a storyline that pitted Joshua Kane and his grandchildren against Jake Simpson and his construction worker crew tearing up the swamp. The story includes a big protest mash-up between the indigenous Native American Indian protestors waving "Save Our Swamp" signs, and the construction crew, as Simpson tries to destroy the muck monster. When Gerber writes in a narration caption, "This Man-Thing which finds in Jake Simpson an offense against nature greater even than itself!," one feels that Gerber sides and identifies with this severe, tragic product of damnation--the ultimate outsider. By the story's end, when Man-Thing scares off the workers by reducing Simpson to a "bloody mass," there is no question on which side of the equation Gerber's loyalties lie. In the next issue, Adventure into Fear # 17 (Oct. 1973), the controversial construction company (Schist) returned for a cameo in the oddball "It Came Out of the Sky" (which, among other quirks, contains a map of Man-Thing's swamp). Once again realized by Mayerik/Trapani, the tale in Fear #17 features a strange retelling of a certain Kryptonian's origin with Wundarr (rhymes with Thundarr! ), an extraterrestrial humanoid sole survivor of a far away planet. This parody, which Gerber dedicated to John Fogerty and Creedence Clearwater Revival for inspiration, nearly cost the writer his job. "The worst incident was when he introduced Wundarr into a Man-Thing story and made him far too close to Superman," Thomas says. "I asked him to change it so it wouldn't upset DC and trusted him to do so ... but I carelessly didn't check him, being so busy ... and Steve did rather little to the story as it stood. This resulted in an angry letter or phone call to Stan Lee from DC, and Stan getting upset with Steve and me, and Steve nearly losing his [freelance] writing job over it." So was Thomas at all surprised when Gerber introduced such an unlikely character in a book as macabre, weird, and decidely EC-ish as Man-Thing as Howard the Duck? "Yes, and not particularly happy," Thomas says. "Marvel's readers generally hadn't shown themselves to like it when too light elements were introduced into Marvel stories. "Of course, I'm infamous as the guy who made Steve kill off Howard the Duck in his first appearance ... but I always knew we could bring him back at some stage. I'll admit, though, I wasn't really thinking there'd be a lot of reader demand for him." Howard became so popular, he spawned his own series, and, in cinema, became a webbed footnote in itself when, in 1986, Howard the Duck became the first big-budget Marvel film adaptation (although the George Lucas-produced movie was also an infamous bomb). Despite the rows over silly characters such as Wundarr and Howard, Thomas had much respect for the feisty Gerber's tenaciousness and ambition. "I admired a lot of what he did with the Man-Thing series, even if it was never a great seller," Thomas says. "I wanted him to have the Man-Thing in it a bit more, even if the template was the old Heap stories in the later Airboy Comics , in which the unspeaking Heap often wandered in near the end of the story to alternately settle and make a shamble of things." Gerber's Man-Thing addressed another issue topical to the early 1970s--a touched Vietnam vet still shell-shocked from his four years in Hanoi. But Gerber truly let his freak flag fly by #19 in the downright weird "The Enchanter's Apprentice," in which an unnamed Howard the Duck makes his first appearance; a story in which Man-Thing becomes peripheral to a tale centered on Korrek, Warrior Prince of Katharta, and Dakimh the Enchanter. The next Man-Thing book, Man-Thing #1 (Jan. 1974), resumed the "Apprentice" storyline, and Howard the Duck had officially arrived. In a July 26, 1999 interview published in Comic Book Artist #7, the late Jim Mooney, who died on March 30, 2008, discussed working with Gerber on Man-Thing . "That was one of my favorite strips, by the way," Mooney told the then-TwoMorrows mag. "In fact, my all-time favorite." 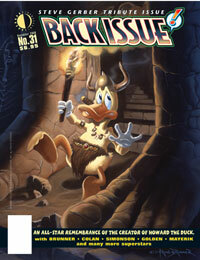 Mooney had followed Mike Ploog and John Buscema, taking over after the latter's last issue. Mooney described his process with Gerber: "Yeah, we almost always worked on the phone," Mooney recalled. "I had never met Steve in the early days, when we were working on it. We'd talk on the phone, and the opportunity I had to meet him was way, way later at the San Diego con, and that was about two years ago [in 1997]." "I really enjoyed working with Steve," Michael Ploog tells BACK ISSUE . "My favorite work was done while working with Steve. He had a talent for looking at a story from different perspectives and choosing best approach to a story. His work always revealed the characters inner feelings, which made you feel the character was genuine." Rich Buckler sums up Man-Thing : "It was like the Swamp Thing, but not really because of the way Steve did it." SIMON SAYS, BE VERY AFRAID! 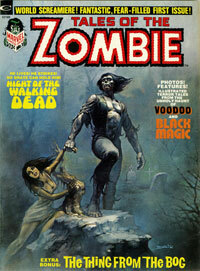 Gerber's Simon Garth, the Zombie, headlined this 1970s black-and-white comic magazine. Sharing common mucky ground with Man-Thing was the Gerber-helmed Tales of the Zombie , featuring Simon Garth, the zombie with the same initials as its writer. Graced with eyeball-frying Boris Vallejo and Earl Norem covers, the black-and-white Zombie magazine became home to assorted black-magic tales, including Brother Voodoo stories after the occult character was evicted from Strange Tales . "I didn't do a lot of rewriting on Steve," Thomas says. "I just talked to him occasionally about things I liked or disliked in the stories. I gave him the Stan Lee/Bill Everett Zombie story from Menace #5 and told him to make that the Zombie of the new Tales from the Zombie series, and I even named him Simon Garth ... but I left most of it up to Steve." With Zombie , Gerber took the Man-Thing formula--lumbering undead lead character, horror and supernatural themes, second person narrative--and one-upped it, quality-wise. Two words on why: Pablo Marcos. The master artist remembers how he arrived to draw Zombie . "At that time, I was working with Sol Brodsky as his assistant," Marcos tells BACK ISSUE from his Clearwater, Florida, home, where he lives with wife Myriam. "I had to be in a office to get my US residency. He was preparing at that time a horror magazine and asked me if I was interested in drawing an adventure. I did eight pages for 'Creature from the Bog.' So they realized my style was good for the Zombie series. Horror, at that time, was the most popular [comics genre]." Marcos enjoyed robust relationships with the most talented artists in the industry. "I had good friendships with George Perez, Jose Luis Garcia-Lopez, Mike Spocito, and many more of the Argentinean and Filipino artists," he says, recalling a smooth-running professional relationship with Gerber, who, contrary to the famous Marvel method, gave Marcos complete scripts. "I was living in Queens, New York. It was quite easy to get together at the office in Manhattan or at Steve's house and chat, but I did develop the stories from the scripts. "Black and white was so proper for horror, and I did become very resourceful with textures to make it even more scary," says Marcos, in somewhat of an understatement. As witnessed by the original illustrations he produced for this issue, Marcos has not lost his touch. Of all the Zombie issues that Marcos drew, the artist has a favorite: "Definitely number one." As well-rendered as the Mayerik and the Tom Sutton work may have been, in this writer's opinion, nothing touched the Peruvian artist's highly detailed ink-and-wash renderings of Garth ... or his storytelling. With Marcos raising the visual game, Gerber stepped up his writing, which ranged from self-contained stories to a two-part story featuring Philip Bliss and divorce court that was ripe with emotion seemingly fueled from something personal. Could it be that Gerber was going through a divorce at the time? The Bliss divorce court story, in which the Zombie literally tears apart the courtroom, would suggest the outpouring of deep real-life distress. The emotion seemed palpable. "Steve must've gone through the divorce by--when?--1973? 1975?" Thomas reckons. "Probably around the time of Zombie . It would've been very much Steve to use such elements in a Marvel story--and why not, as long as he didn't use it to vilify his soon-to-be-ex-wife." Nevertheless, Thomas does not recall for sure if this Zombie tale coincided with Gerber's personal problems. "Steve and I were never close friends," Thomas says, "although I'll never forget my memory of walking down a midtown street the day he flew in, with me carrying a big beanbag chair (all the rage then) and our stuffing it into a cab to take it to my apartment on E. 87th Street. Jeanie and I had split up for several months at that time, and that was part of my new bachelor lifestyle, I guess. Steve, of course, brought his new bride and soon-to-be child to NYC, but I don't remember her well and it wasn't a happy marriage; they split up before too long. I should talk." What was it about Gerber's writing and Marcos' art that made their collaboration so powerful? "He and I just made a good team," Marcos says. "Steve had a vivid idea of the nature of the Zombie. He was a very enthusiastic and fantastic writer. We could talk about the new adventures like it was real life." "I was very fortunate having worked with people as talented as Gerber and Thomas," Marcos says. "Our work used to go beyond assignments. I can say it was part of our life." Our free preview ends here, but the Son of Satan, Lilith, Morbius the Living Vampire, and the Living Mummy are ready to swoop in for its conclusion in BACK ISSUE #31. BACK ISSUE #31 salutes the comics and animation career of the late, great, and groundbreaking writer STEVE GERBER, spotlighting Howard the Duck, Omega the Unknown, "Gerber in the Marvel Universe,", Crazy! Magazine, Metal Men, Mister Miracle, The Phantom Zone, Sludge, Nevada, Hard Time, and the animated television favorite Thundarr the Barbarian. Art by and commentary from FRANK BRUNNER, RICH BUCKLER, GENE COLAN, MARK EVANIER, MICHAEL GOLDEN, STAN LEE, PAUL LEVITZ, PABLO MARCOS, VAL MAYERIK, JIM MOONEY, MARTIN PASKO, MIKE PLOOG, DAVE SIMONS, ROGER SLIFER, WALT SIMONSON, RON WILSON, and many, many others. And Howard the Duck turns barbarian in a cover painting by FRANK BRUNNER! Edited by MICHAEL EURY. 100 pages, $6.95.